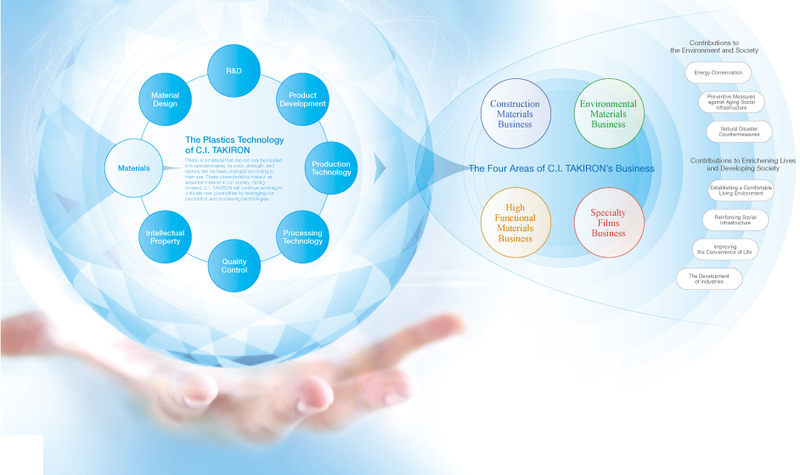 We offer four business areas with plastics technology at the core. Our company provides advanced plastic processing technologies to wide-ranging business areas including construction materials that require high durability and advanced molding technology, as well as agricultural, civil engineering, and industrial materials and daily commodities. We will continue to work with plastic, which holds infinite potential, to provide products that will be useful in society and people’s daily lives. Supports comfortable home and urban environments. Contributes to the revitalization of agriculture and supports safety of social infrastructure. We contribute to the revitalization of agriculture by providing high quality agricultural materials such as agricultural films and irrigation tubes. We also offer materials that support the functions and safety of our social infrastructure, appropriate for a variety of purposes and applications. We offer high functional materials that can be used in various categories, from industrial use to household electrical appliances. Our highly functional plastics play an important role in many areas. These range from industrial plastics for technically demanding semiconductor and liquid crystal manufacturing, to household electrical appliances such as cameras and smartphones, which require high reliability. Optimized design is made possible for various uses such as product labels, packaging products, and more. Our internationally-recognized, advanced film technology allows optimal design, resulting in beautiful product labels that improve product value and packaging films that meet the demand for high-hermeticity.